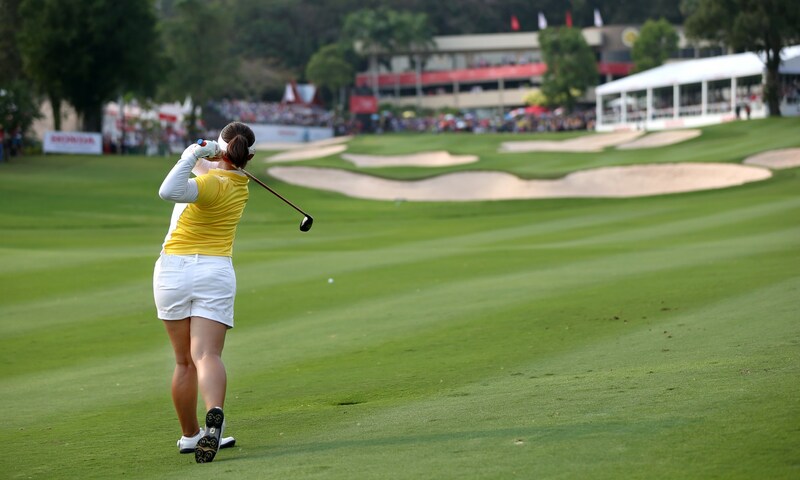 The Honda LPGA Thailand is the first and only women’s professional golf in Thailand on the LPGA Tour. First teed-off in 2006, the tournament showcases 60 of world’s best LPGA players and 10 risings stars of women’s golf to win the prize purse of $1.6 million. 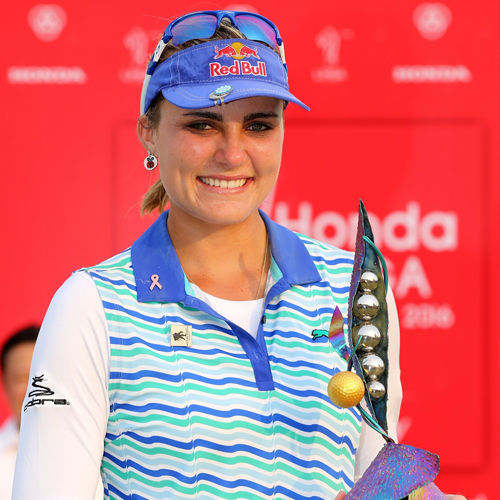 Now in it’s thirteenth year, the Honda LPGA Thailand 2019, promoted and organized by IMG, will feature 70 female golfers, including 58 professionals from the 2019 LPGA Priority List, the winners from the Pure Silk-Bahamas LPGA Classic 2019 and 2019 ISPS Honda Women’s Australian Open, as well as nice invited players and the winner from the Honda LPGA Thailand National Qualifiers. 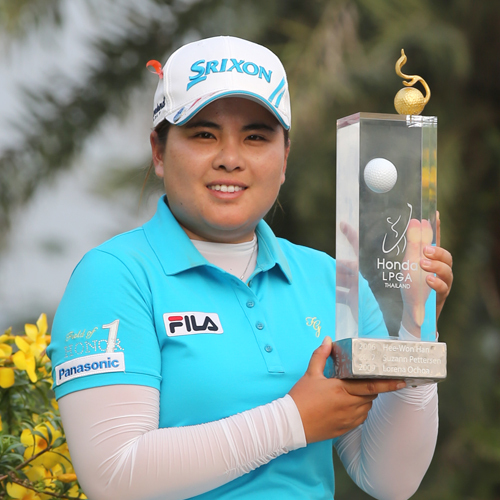 Among the many top Thai golfers scheduled to join the tournament are two pros who first joined the Honda LPGA Thailand as amateurs and now enjoy a very successful career on the LPGA Tour – Ariya “May” Jutanugarn (No.1 in the Rolex Rankings) and Moriya “Mo” Jutanugarn (champion of Hugel-JTBC LA Open last April). In addition, there will also be a “Festival Village” that will feature interactive activities and food stalls for spectators to enjoy across the four days. Fun under the sun, there is something for everyone. The Honda LPGA Thailand 2019, Thailand’s biggest golf tournament is a “whole” in one. 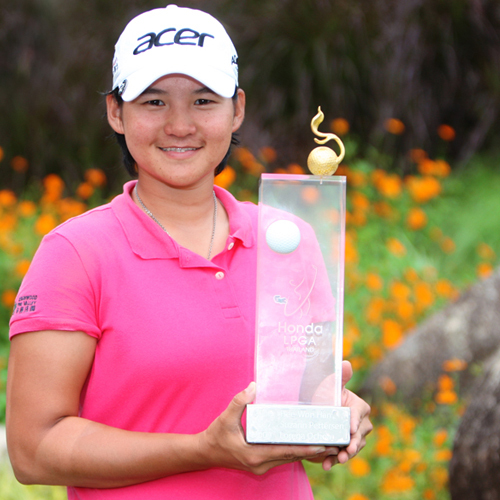 The Champion’s trophy was designed by emerging Thai artist, Saruta Kiatparkpoom. She cited the eagle as her source of inspiration for the trophy as the animal is an embodiment of strength and elegance which very much resembled the golfers who grace the green with their poise and determination. Amy Yang held off So Yeon Ryu on the final day of the Honda LPGA Thailand to win the event for the second time in the last three seasons and pick up her third career victory. With a birdie on the final hole, Yang carded a final round 68 and set a new tournament scoring record at 22 under par. 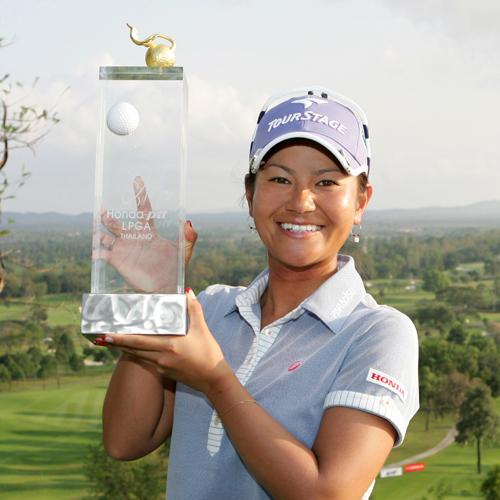 She bested the previous champions mark by 1 stroke (Suzann Pettersen 2007 and Ai Miyazato 2010). 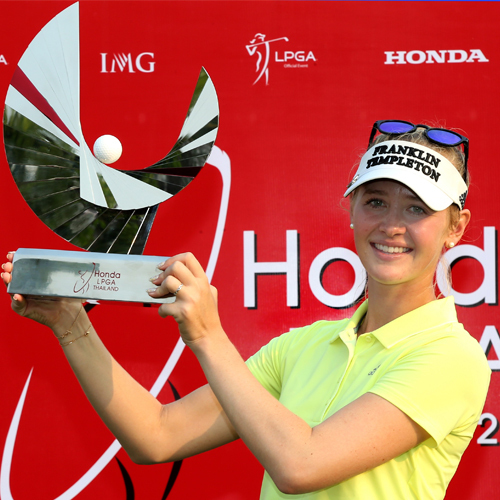 Thompson captured her seventh career win on the LPGA Tour on Sunday at the Honda LPGA THAILAND. With her victory, Thompson became the first American in history to win in this event. The 21-year-old took command early in the week with an opening round 8-under par, 64 to take the outright lead in round one. Despite scrambling to a second round even par, 72, Thompson cruised on the weekend, posting 64 again on Saturday to take a four stroke lead entering the final round and closing with a 4-under par, 68 to win by six-strokes ahead of In Gee Chun. Amy Yang had finished in the top-5 in three of the previous for tournaments she played in dating back to 2014 but was able to breakthrough in Thailand for her second career victory. 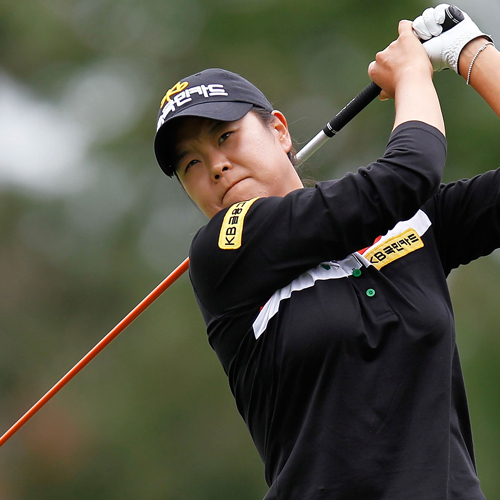 Yang shot a final-round 69 to edge out Yani Tseng, Mirim Lee and Stacy Lewis by two strokes. She battled Stacy Lewis on the weekend and were tied atop the leaderboard heading to No.15,Lewis made a double bogey while Yang made a birdies, which made Yang leads Lewis for 3 strokes and won the tournament in thhe end. 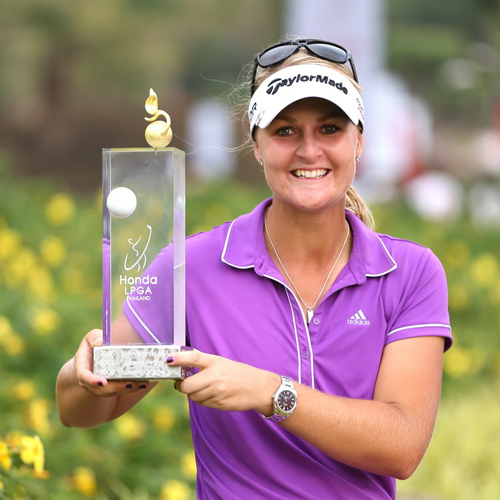 Anna Nordqvist battled a star-studded leaderboard on Sunday and shot a 4-under 68 to claim her third career LPGA Tour title at the Honda LPGA THAILAND. The 26-year old from Sweden finished the week at 15-under par and two shots ahead of Rolex World Ranking No. 1 Inbee Park. Nordqvist started the day with a four-shot lead over Park and American Michelle Wie and pulled off her first victory in nearly five years and since the 2009 LPGA Championship. 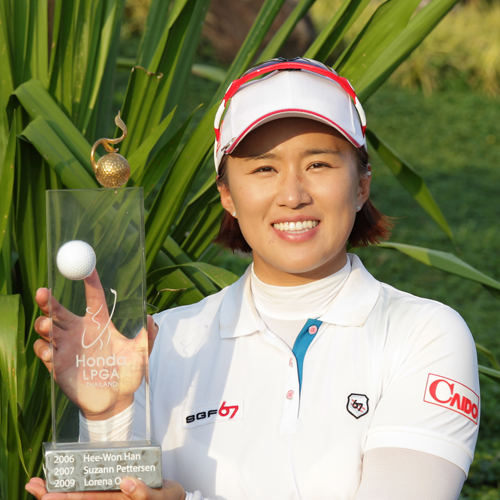 2012 LPGA Official Money title and Vare Trophy winner Inbee Park got her 2013 season off to a hot start, capturing a one-shot victory at the Honda LPGA THAILAND in her first event of the year. The victory came as a bit of a shock to Park as she trailed 17-year-old Thailand native Ariya Jutanugarn by two shots when she finished her round. 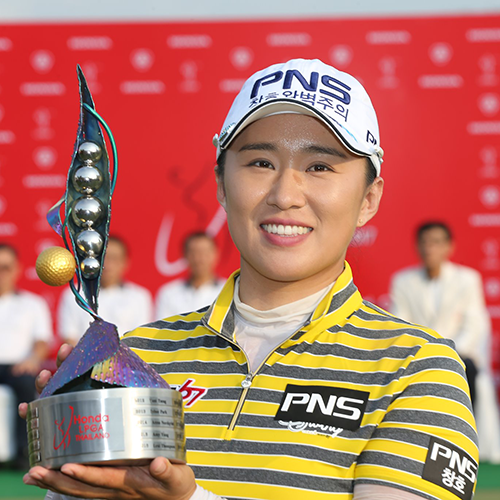 But Park ended up with a one-stroke victory less than 15 minutes later when Jutanugarn lipped out a 3-foot-putt for double bogey on the par-5 18th hole. Park trailed Jutanugarn by four shots entering Sunday’s final round but charged back with a final round 5-under 67 to take home her fourth career victory. Rolex World Ranking No. 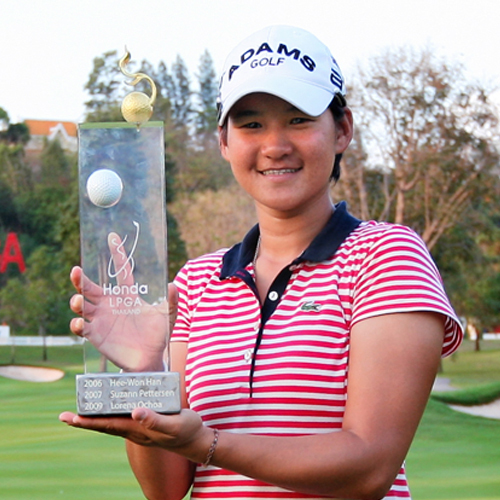 1 Yani Tseng successfully defended her title at the Honda LPGA THAILAND and captured her first win of the 2012 season. Tseng nearly knocked her 104-yard approach shot in the hole on the par-5 18th on the final day and sank the tap-in birdie putt to capture a one-shot victory over the 2010 champion of the event, Ai Miyazato. Tseng got off to a hot start en route to firing a final-round, 6-under 66. She birdied the 17th to regain a one-shot lead and after Miyazato knocked her third shot close on 18 to give herself a putt to tie Tseng, that is when Tseng hit her impressive approach into the 18th green that pretty much sealed the victory. Rolex Rankings No.1 Yani Tseng shot a final round 6-under-par 66 to win the season-opening Honda LPGA THAILAND by five shots over Michelle Wie. The then 22-year-old began her 2011 season with victories on the Ladies European Tour (LET) at the Australian Open and Australian Ladies Masters in consecutive weeks prior to the LPGA’s season opener. The overnight leader, Tseng kept herself in contention with six birdies in her first 13 holes before her first-and-only blemish of the day at 14, where she made bogey. She rebounded with a birdie at 15 and never looked back, claiming her sixth-career LPGA Tour victory at 15-under-par 273. Japan’s Ai Miyazato shot 9-under-par 63 to win the season-opening Honda LPGA THAILAND by one shot over 2007 champ Suzann Pettersen. Miyazato was 10-under-par in her final 16 holes and chipped-in for birdie at 18 to clinch her second-career LPGA victory. Miyazato entered Sunday five shots behind overnight leader Pettersen, but used a six-hole stretch to erase that deficit and turn Sunday’s final round at Siam Country Club Pattaya Old Course into a two-player sprint to the finish. Rolex World Ranking No. 1 Lorena Ochoa made a statement in her season debut in 2009 and opened her year with a victory at the Honda LPGA THAILAND. Ochoa entered the final round tied for second with Brittany Lang – three strokes behind 54-hole leader Paula Creamer. Ochoa and Creamer teed off in Sunday’s final group and on the back nine, Ochoa made a birdie on holes 11 and 13 before carding her lone bogey on the par-3, 171-yard 16th hole. She erased her step back by making a five-foot putt for birdie on the 17th hole to secure the victory. Suzann Pettersen went wire-to-wire to win her fifth LPGA Tour event of the season. 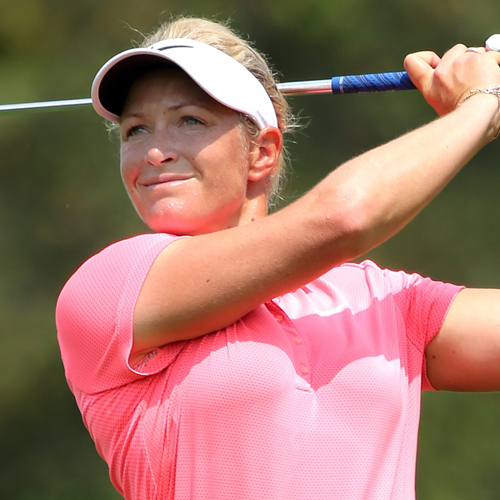 It appeared there was no way Pettersen could avoid cashing the $195,000 winner’s check after she fired a third-round 9-under-par 63 to hold a seven-stroke, 54-hole lead over Laura Davies. But Davies battled Pettersen the entire final round and caught up with the Norwegian and were tied heading to the final hole. Pettersen sealed the win with a 15-foot eagle putt. Hee Won Han claimed her sixth career LPGA tour title in Thailand in 2006 and ended up being the last win of her career. Han Trialed Nicole Castrale by five shots over Diana D’Alessio and a winning score of 14-under par. It was her second win of the 2006 season.